For years Mae has been living with her older sister Abbie running away, but she always returns unharmed and without explanation. The only clue as to where she goes or what she does was revealed the one time Mae sneaked into her room and found a box of strange objects. This time she’s been gone several years when Mae gets a call to pick her up from the Sheriff’s office. Gene Ha begins Mae with what seems to be fifty pages of tease. It’s Abbie who has the glamorous life, while Mae remained in the small town where they grew up and now attends college there. 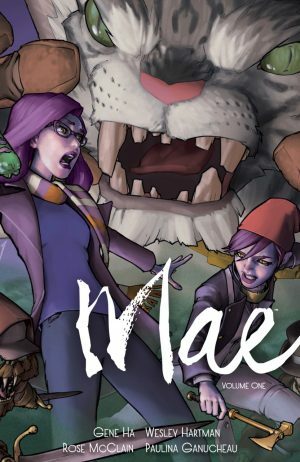 Once introduced, a drunken Abbie starts dropping names, and it becomes serious after that when she’s attacked by strange creatures, allies of whom eventually abduct Abbie and Mae’s father. Getting him back means crossing the dimensions to the city of Krunýřves. 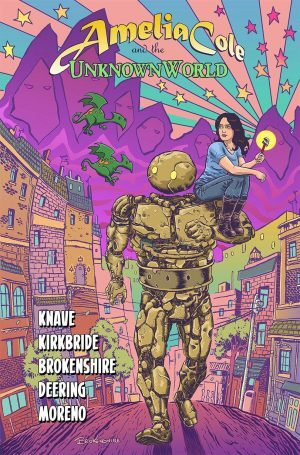 Abbie knows it well, and in turn is well known for past swashbuckling exploits, but the purpose of Ha’s leisurely build up is to contrast Mae’s everyday life with the fantasy she’s now thrown into. This is a land into which other humans have wandered, many from the Czech Republic where the first dimensional portal was discovered. It’s a nice touch, and explains many names sounding East European, which gives the series a suitably exotic feeling. Ha’s artwork has always been technically tremendous and gorgeous to look at, so no change there. Where he really scores above and beyond expectation is with his creativity and imagination. There’s no point in journeying to another world if all it does is extend the familiar, and Ha fills this new world with wonders such as rehydratable soldiers, five-headed dukes, and all sorts of neat little background asides. Ha’s always been good at conveying personality, and that’s really necessary to contrast the gung-ho Abbie with the far more reserved Mae, whose analytical approach takes more time to acclimatise to a situation. You’ll become so wrapped up in the plot that the final two chapters will come as a disappointment, but think of them as bonus rather than replacement chapters, and don’t be quick to rush to conclusions. 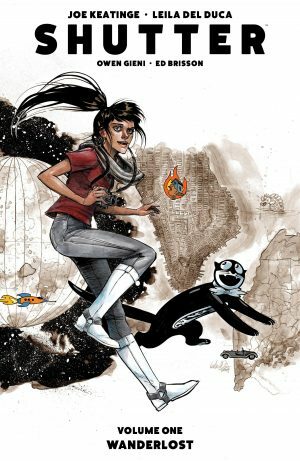 Ha writes the first, featuring a younger and even more enthusiastic Abbie attempting to find her way back to Earth. 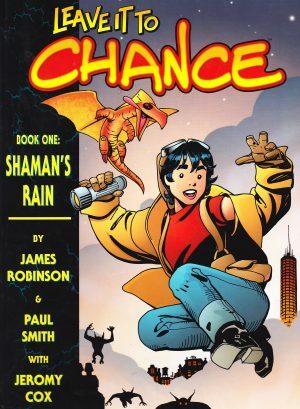 It’s nicely drawn by Paulina Ganucheau, features a neat trick and eventually informs earlier events. 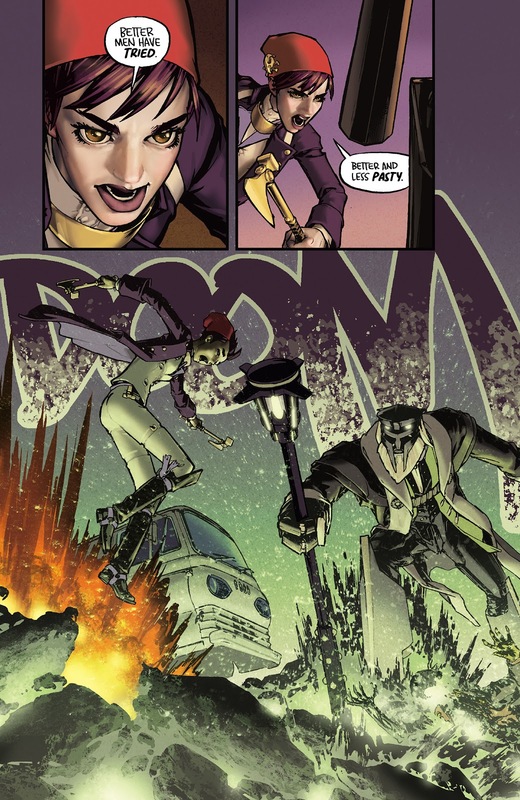 Danny Busiek and Sally Jane Thompson then detail how Mae first became friends with Dahlia, who features in the main story. This is more trivial, continuing the theme of Mae being a huge science fiction and fantasy fan, but not really going anywhere. 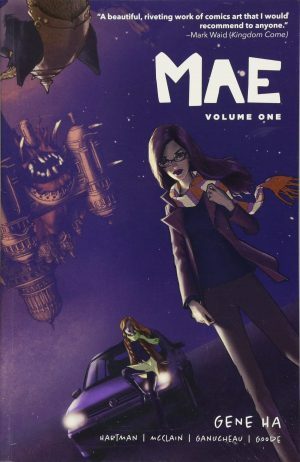 Given that five chapters don’t come anywhere close to resolving any plot, and actually keep throwing in new elements, it’s best to look at Mae as a long form novel where the pleasure is the journey, and the plot just the means of extending that. 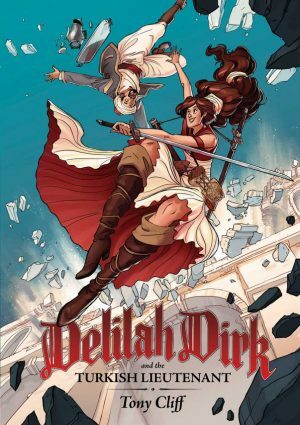 Originally published by Dark Horse in 2016, the current edition is from Lion Forge, who’re publishing a second volume in 2019.